The N/E corner of Queen and John as illustrated in 1851. Interesting because two of the buildings survive to this day. The W. H. Brayley dry goods store was the Beverly Tavern for years and if you look closely the small shop to the left (W.H. Smith), is still there and still selling books as a BMV outlet! I had a good look at the BMV today (including the basement) and realize that the building has at some point been rebuilt on top of the original rubble foundation. A little research shows that WH Smith did not enter the Canadian market until 1958. A view of the distinctive roof line from the 1840’s (or so) and the original St Patrick’s Market. St George the Martyr Church can be seen in the distance. The same building (now the famous Beverley Tavern) in the early 1980’s. Photo by Patrick Cummins. The distinctive roof line can still be identified under the modern facade. St. Patrick’s Market and the tower as seen in the first illustration. 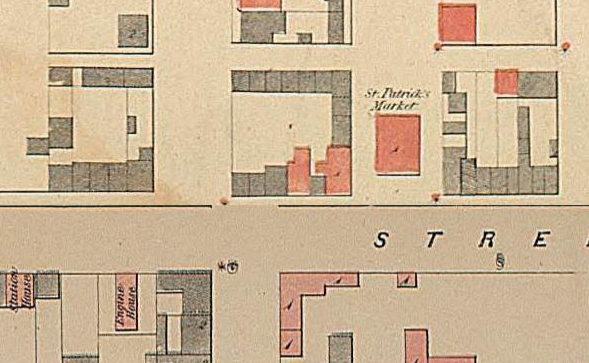 On the map below from 1858 the Market and the dry goods store are both evident.